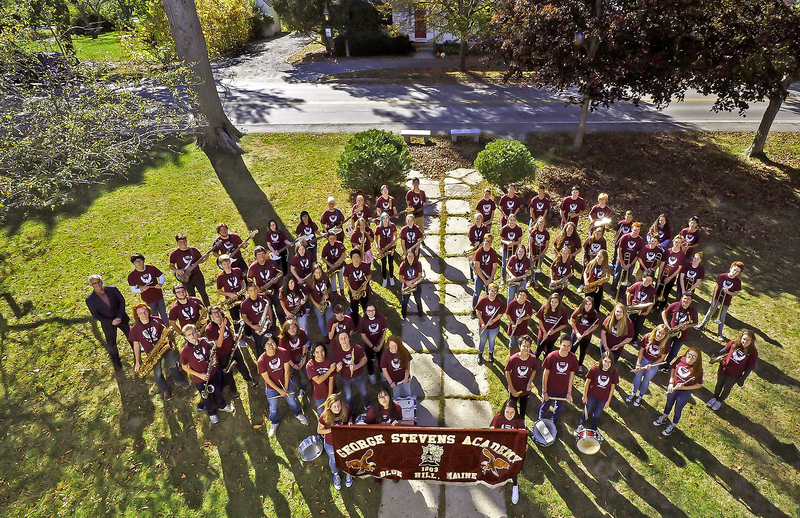 Join George Stevens Academy music groups for their Annual Holiday Concert on Tuesday, December 5 at 6:45pm featuring the GSA Band, Jazz Band, four Jazz Combos, Period 6 Steel Band Class & the Planet Pan Steel Band. Welcome music will be performed by the Holiday Angels at 6:30pm. If you would to like reserve seating, please call 374-2800. Does your school/district have a gifted and talented art program? Who identifies Gifted and Talented Artists and how? Who teaches these students and when? Please join R.S.V.P. ME on November 30th from 3:30 to 5:00 PM for a roundtable discussion about our Gifted and Talented Art Programs. 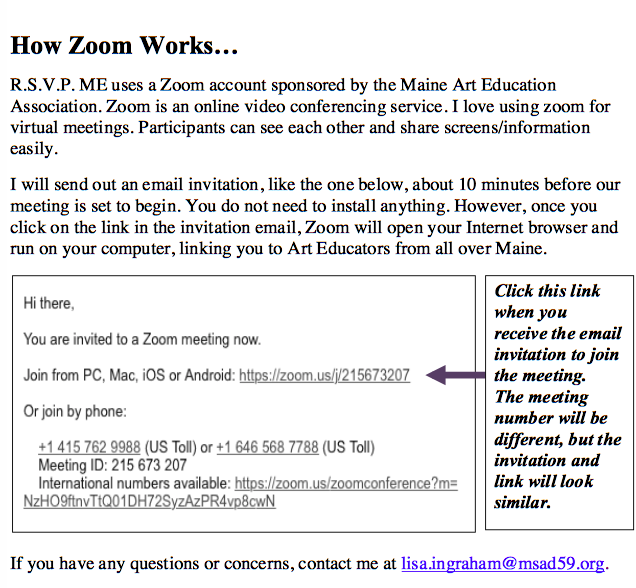 Sign up to participate in this Zoom* Online Video Conference and earn 1.5 contact hours as a Maine Art Education Association member by emailing lisa.ingraham@msad59.org. If you have questions, comments or suggestions for future topics, email Lisa. Zoom Video Conferencing is done completely online. I love the idea of Giving Tuesday and already this morning I’ve received several emails from organizations and individuals reaching out and asking for support. Some have asked for financial support and others include other ideas for support. During Thanksgiving break my family had a chance to celebrate an 87 year old aunt who passed away. At the funeral the family displayed pictures and items that represented Aunt Mart and stories were shared about her life from when she was very young and up until recently. She was one of those people who lended a helping hand throughout her life. Just after high school she worked in a sewing factory and later on delivered mail on a rural route. Her sewing skills were put to good use over the years. In fact, Aunt Mart and my mother in law sewed my wedding dress. She never married or had children of her own but she was there for her nephews and nieces and supported their parents in multiple ways. She was a quiet giver, always ready to lend a helping hand. Most of the family was there to help clean out her home and one thing became very clear. She was an incredible giver! She didn’t just give on Giving Tuesday but all year round. She made financial donations to organizations that supported animals, the environment, and education. She was a knitter and a crocheter and created many afghans that were donated to organizations who needed them. In the last year she made one for everyone in the family. And, she loved watching the birds and fed them daily; another way that Aunt Mart gave to the world. I was so grateful to be with family to celebrate, not only Thanksgiving, but Aunt Mart’s life. The experience gave me the chance to pause and consider my own giving. And, to think about what Aunt Mart’s giving life means to me. With Giving Tuesday upon us, I just want you to know that I appreciate what you give each day to young people through visual and performing arts education. The gift that you offer has the potential to impact them the rest of their lives. I hope that you have a chance to pause today and think about your giving. While visiting Sedomocha School on the day music educator and Maine Arts Leadership Initiative (MALI) Teacher Leader Kaitlin Young was named Maine’s 2018 Teacher of the Year I visited Bobbi Tardif’s art classroom. It reminded me of the room that I taught in for many years. Previously the home of an Industrial Arts or Industrial Technology class. Bobbi has transformed her space into an alive and stimulating yet calming and pleasant learning environment. Bobbi had amazing posters and she was kind enough to send me a follow up email with the information so I can share it with you. Thank you Bobbi! 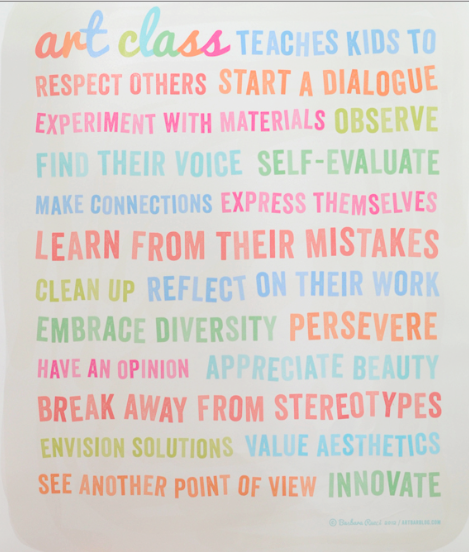 Perhaps you have posters in your classroom that are similar in nature. Please do share the information for others to learn from, below in the Comment section or please email me at argy.nestor@maine.gov so I can share. Thanks! Not sure if you’ve tuned into the work of “visual notetakers”. Visual learners, thinkers, and others are taking visual note or sketchnoting to a different level. Taking notes using visual ideas is something that many artists have been aware of for years. How many times have you sat in teachers meetings and found yourself documenting what the presenter is saying in images? Recently, the use of visual notes is taking off not just for presenters, or documenting notes from in a business meeting, but in education as a teaching tool. This article from Education Week called How Visual Notes Helped a Student With a Learning Disability Thrive. The article provides information on how learning to sketch note or visual notetaker can help support the learning of students with learning disability. It can provide an avenue and open doors for learning in a way that students can take off with the idea. There is a book available called The Sketchnote Handbook written by Mike Rohde that teaches “regular people how to create their own sketch notes.” Yup, says that right on the website. READ the entire article and learn more! Visual Art teachers have their eyes open to turning something that they ‘see’ or ‘do’ into an idea for a lesson. This story is about a veteran nurse in Toronto who turned refuse into a mural. For 28 years Tilda Shalof collected items from her work – plastic items including caps, connectors, stoppers, and much more. The things that are left over from treating some of the sickest patients. She was going to leave her hospital job in the ICU and met with a friend, an artist, to create a mural that used over 100,000 of the colorful items. The art work is installed in the Toronto General Hospital and measures 4 feet high by 9 feet long. When Tilda looks at the items she is reminded of the patients and how all of the items represent the work and care that a hospital staff provides to patients. You can read the article from the Toronto Star and watch the video at THIS LINK. Sharing this article and/or video could be an inspiration for your students. 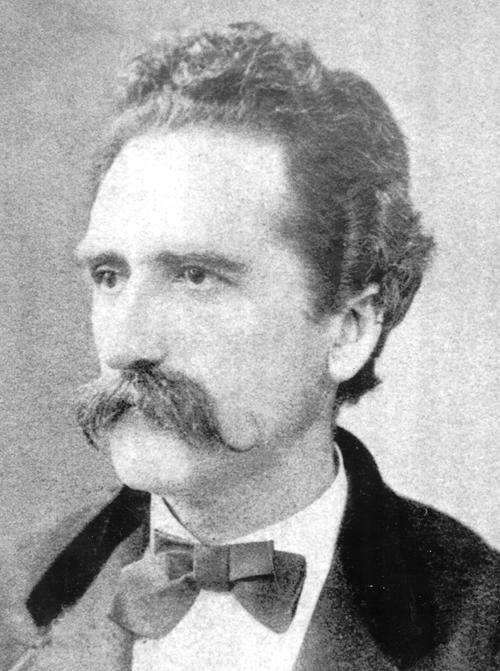 Friends of the Kotzschmar Organ (FOKO) is the administrator of this fund, arranges the auditions and disperses the awards. 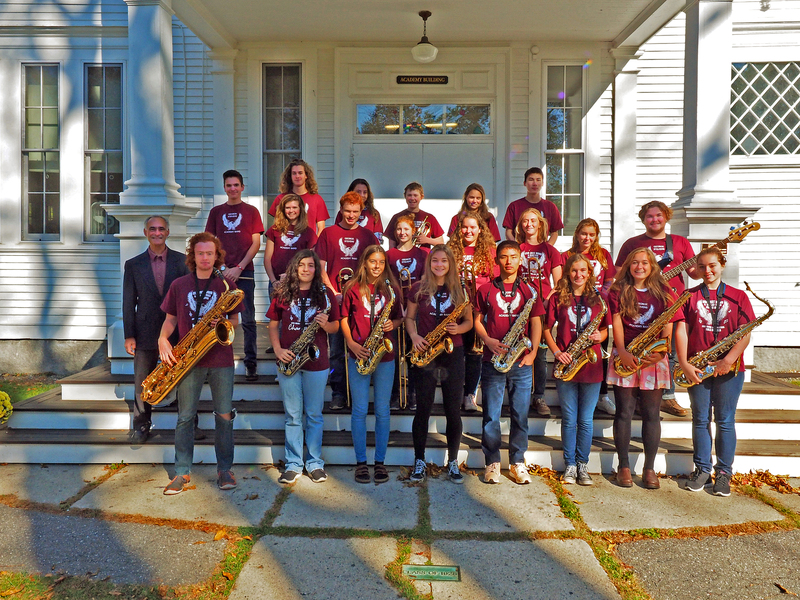 Auditions are open to students age 10-18 (grades 4-12), and age 19-25, studying organ, piano, voice, and all orchestral instruments. For more information and APPLICATION RULES AND MATERIALS. You are currently browsing the me arts ed blog archives for November, 2017.